Spectacular Modern Waterfront Property. Walk to the Beach. Accommodates 8. Dolphin View Beach House is absolute waterfront, with easy beach access, peace and tranquillity, and if the timing is right, dolphins and whales on view. Ideal location for exploring Tasmania, the property is only a 20 minute drive from Hobart Airport and 40 minutes to Hobart. 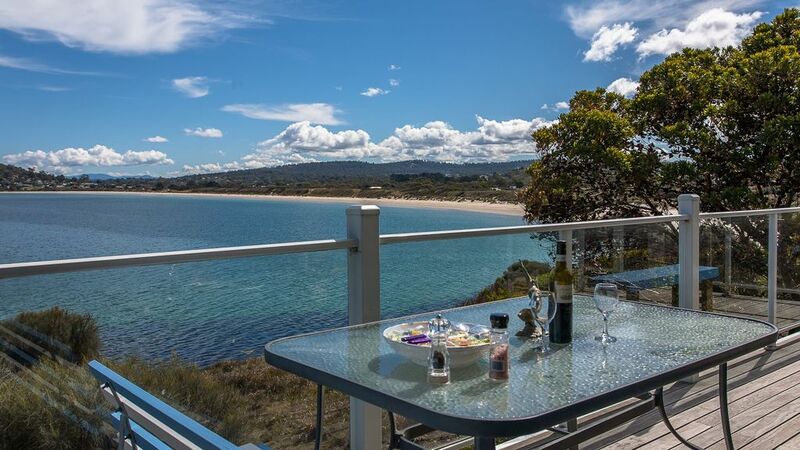 The house offers incredible views over the ocean to Mt Wellington, the south west wilderness and Hobart – you will see the lights at night – and is ideal to view the southern lights. Unwinding & embrace the holiday lifestyle from this magnificent home. Rest and chill; watch the sun rise; sip a wine on the deck as you watch the sun go down; read in the comfort of the lounge overlooking the water, listen to the lapping of the sea at night; enjoy the stillness on the rocks at the water’s edge; or play and on the pristine beach and swim. Combine your beach lifestyle with visits to MONA (40 minutes), Salamanca Market (40 minutes), Richmond Village (30 minutes), Port Arthur (50 minutes), East Coast (60 minutes), Launceston (2 hours, 15 minutes). With support just across the street, we offer friendly local knowledge on fun places to visit including nearby gourmet restaurants and cafes, family wineries, farmers markets, chocolatiers, and designer art and crafts studios. The general store is two minutes walk. Supermarket, post office, banks only 15 mins - on way from the airport. North facing, warm and sunny, the front balcony of this four bedroom home away from home provides unrestricted 180 degree bay view ambience from the main bedroom, open plan kitchen and living area, The quiet, secluded and safe swimming beach for children is two minutes away down a private track, or walk 20 paces to the end of the garden path and jump in to the pristine water. Our guests experience regular sightings of dolphins, whales in season, and visiting wildlife including echidna, small kangaroos, native marsupials and parrots. Super comfortable accommodation includes two queen beds (including chiropractic), a double bed, and two single beds. Newly furnished and beautifully appointed in retro style with leather seating, throw rugs, subtle lighting, cosy bedside settings. The bathroom has a separate shower and a bath. The toilet is separate. There are 2 large ocean facing and rear entertaining decks with sun chairs. Ideal for couples, families and gatherings of friends. Fully self-contained, we provide a cook top, oven, microwave and a BBQ on the deck plus a washing machine, dryer, and ironing facilities. Quality bed linen and towels are provided. We provide a swing set, toys, family board games, books, a TV and DVDs. gate blocking the deck from access to the yard is a baby gate, & the yard is not fully fenced. A maximum of 8 people has been set for this property. All pricing includes up to 4 people, with extra people charged at $25 per person per night. A relaxing home with very calming energy. The Feng Shui is very balanced & supportive of a peaceful environment, ideal for unwinding & embracing the holiday lifestyle. We will return & recommend Dolphin View to our friends. "For your added security, this property is only managed in Australia and we never request payments be made to overseas bank accounts"
1) A deposit is required to secure the booking. Payment of the rental deposit constitutes the clients acceptance of these terms. a) The guest pays 20% of the booking amount once the booking is accepted and the remaining balance 28 days. The guest pays 100% of the booking amount if the booking request date is within this period. b) If the guest cancels their booking within 28 days of arrival the owner will keep 100% of the total booking amount. c) If the guest cancels their booking before this, 50% of the total booking amount will be refunded. 2) Number of guests is not to exceed the number stated on the Booking Confirmation Notice or subsequently agreed in writing and a maximum of 8. Fees will apply for extra guests not agreed to with the owner in advance. 3) Parties and functions are strictly prohibited. The price charged is for domestic use only and not commercial. Accordingly, this rate does not allow for extra wear associated with functions in terms of cleaning, garbage removal, wear and tear, repairs, etc. Use contrary to this will result in additional charges. 4) Damages, breakages, theft and loss are the tenant’s responsibility during stay. 5) Breakages must be reported to the owner at the earliest time and paid for. 6) Departure – the property should be left in a similar state to its condition on arrival. Check-out time is 10:00am by the latest, to allow time to prepare the property for the next guests. 7) Removing posts and signs and parking on the LHS of the top of the driveway is strictly prohibited and could incur of cost of $3000 - $4000 to cover damage to the underground waste water system under this area. 8) Disturbance to our neighbours including excessive noise is prohibited and may result in termination of rental and additional charges. 9) While this is a pet friendly property (pets can be safe on the deck) arrangements must be made with the property manager. 10) Loss - the owner takes no responsibility for the tenants personal property. Any property left on the premises can be regained by sending a self addressed mail bag to the owners property. 11) Variations to these conditions may only be made by prior arrangements in writing to the property manager or owner. Could do with 2 nd bathroom/toilet. Otherwise perfect. GreT views. Well stocked kitchen and pantry. A beautiful property in a stunning location. Everything has been provided for. The best equipped holiday house we have stayed in. Very comfortable and well catered. Beautiful view of beach, bay and Mt Wellington in distance. Easy path to beach. We had beautiful sunny spring weather one day and the kids swam in the water and then a cold wild day the next but the house served us well in both conditions - games, DVDs, and comfy bed with a view and a book. Would love to stay longer to enjoy the amazing views and to stay in beautiful accomodation with all our needs provided for. We have just returned from a week long stay at Dolphin View Beach House. I can't recommend it highly enough. It is perfect for a relaxing break with young children, so close to a calm, child friendly beach, remote but not too remote. The house is incredibly well equipped and one of the cleanest I've been to. The property agent was also extremely helpful both prior and during the stay. Thanks for your lovely review Vicky. It was our pleasure having your family & pet stay at Dolphin View Beach House.